Of the three properties that we considered, only one felt truly right. It met all of our requirements and then some. A beautiful, 2.5 acres faces south. There is a well, septic tank, and both Internet and cell phone accessibility. We have space for a large vegetable garden and there's even room for our very own fruit orchard. While there is a liveable structure on the land, it is an older model mobile home which has seen better days. It isn't energy efficient and wouldn't be worth fixing up. So, we made the decision to build a new home. The mobile home will provide us a place to live until the house is complete. And once the house is built, we'll disassemble the mobile home, taking care to preserve all usable parts, and then recycle them into other things. After checking with the planning/building department to learn exactly what we could and couldn't do on the property, we chose the spot for our home. It was a priority to consider nature in all of our actions. We chose a construction site which was relatively free of trees. Even so, a few had to come down. Trees are fabulous at absorbing CO2 from the atmosphere. But here's the thing ... when they are cut, all of that stored CO2 is released. The trees which were taken down were milled on site. We constructed a solar drier to season the lumber and, once it's ready, will use the lumber, inside the house, for doors, shelves, cabinets, trim, and even office desks. Nothing will be wasted. The next task was to design the home. I'm lucky ... my "other half", "Art", designs homes for a living. He pays special attention to things like how the air flows through a home, how the sun can help heat our environment during the winter, and using space efficiently. Our 1600 square foot home will be passive solar with an open floor plan. A passive solar home uses the angle of the sun to heat the home during the winter and blocks it during the hot summer months. Photovoltaic panels will be placed on the roof. They'll generate power which will be sold back to the grid. As batteries become more efficient, we'll be able to upgrade our system to be totally off the grid. After careful consideration, we chose a controversial material for the construction of the home ... ICFs (Insulated Concrete Forms). If you're not familiar with ICFs, they are basically Styrofoam forms which are filled with concrete. We all know the nightmare of Styrofoam ... it never biodegrades. In a landfill that's a real problem but as a building material, it's a valuable quality. Concrete, while not the most environmental material, does have amazing insulating properties. Together with the forms, the R-Value makes this system one of the most efficient building methods around. And, it is not subject to pest or weather problems experienced with other types of construction. We're now well underway with the shell of the house. In future posts, I'll share more about the building process and my experiences as a property owner. Last week we continued our "Sharing Resources" theme and focused on tools. I live in a great neighborhood! My neighbors are willing to share whatever they have. Still, this challenge was hard for me because I was raised under the "Neither a borrower nor a lender be" concept which suggests that one could, potentially, lose a friend if something borrowed wasn't returned in time or in perfect shape. In thinking about it, I realized that a tool bank is the perfect answer to that dilemma. Since no one would actually own the tools, there's really no borrowing or lending. I really liked Vicality's post this week. Not only did they suggest that people share tools, they took it a step further and asked people to share their services. Check out What’s in your toolbox? What can you share? for their creative ideas. Alicia and her husband not only shared tools, but freed up valuable space in their garage. She says this: "Our son and daughter-in-law bought their first home 2 years ago. Alan decided to go through our tools in the garage and give them a lot of things they didn't have. It was a real blessing to them but it was also a blessing to us. We found like you said that some of these tools weren't being used. It freed up quite a bit of room in the garage and helped them fill theirs up with tools they could use. I think your idea of starting a Tool Bank is an awesome idea!" By the way, Alicia has started a new blog which is associated with their site, Eco Natural Soap. I've been browsing the new blog and it's filled with wonderful information. So hop over and check it out. It's called Eco Natural Blog. Christine dropped by and shared this: "The problem with sharing tools is that the user doesn't always respect the borrowed item as the owner would wish. The organiser at the local community allotment sometimes puts her head in her hands when she inspects her tool shed and sees what her users have done with things. You need to be able to trust the people you share with and this doesn't always work. I'm afraid that I have bought good gardening tools and expect to wear them out rather than share them. If they last me out they will go on freecycle or to people who are just starting out." Lois accepted the challenge. Here are her comments: "So many people attach financial meaning to their tools and don't like sharing them. I grew up in a neighborhood that shared what they had and continue to share my tools. My sons, now adults, have their own tools but they didn't bother to purchase any tools they knew I owned because they could easily borrow mine and by buying tools I didn't have it increased the variety of tools I had access to." Charlotte is away but says: "Hi Small Footprints, I will be away next week but have scheduled a post about this weeks challenge, Tools. 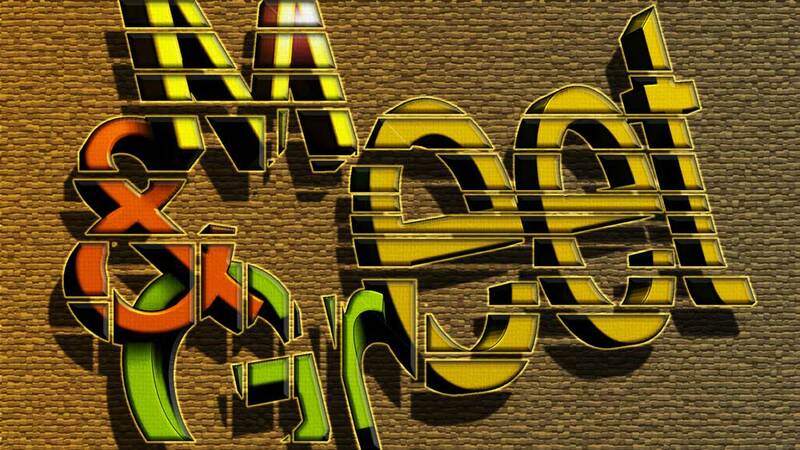 I don´t know if it will work and I have had problems with losing tags while scheduling tweets. But I hope it won´t be any problems... It will be published on Tuesday 24th. I am disconnected and off all week. But I get in touch as soon as I am back ready for a new challenge :) " I tried to find the post, Charlotte, but didn't have any luck. When you return, please send me the link and we'll include it in the next challenge. Have a great vacation!! This challenge showed me that the way we've been raised or have "always done it" doesn't always coincide with what's best for the planet. To live green we must re-evaluate everything and make choices based on the environment. It's hard to break habits or re-learn a particular practice ... but the earth depends on our ability to do so! Did you know that only about 15 percent of discarded textiles are reclaimed for recycling each year? That means that the rest goes to a landfill. 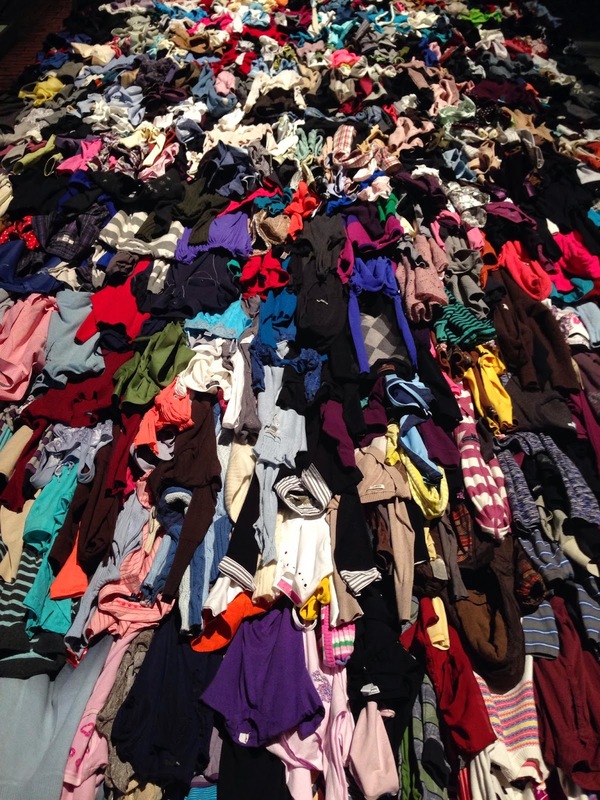 In fact, over 126 million cubic yards of landfill space is taken up by textiles. Here's another interesting fact ... your tax dollars contribute to waste disposal. Yep, if you pay taxes, you are paying to get rid of usable stuff ... even if you, yourself, recycle and reuse textiles. Want more? Polymers (a form of plastic), which are used by most clothing manufacturers, have shown up in our oceans. They are contributing to the pollution of our food chain. Anything in a landfill is a concern. Textiles are a particular problem because of the dyes and chemicals which they contain. This week, share clothing, footwear, curtains, carpets, bedspreads, etc. Do this via donating to a second hand store, hosting a clothing swap, gifting items to friends and family, shopping at a thrift store, etc. If you have items such as torn towels or stained carpets to dispose of, consider giving them to your local animal shelter. The idea is to keep textiles out of landfills and share this usable resource. One note ... if you donate textiles to second hand/thrift stores, or even to charities, find out what they do with items that aren't used. Choose organizations which recycle them into furniture padding, insulation, wiping rags, recycled fabrics and more. Do you sew, knit, or crochet? How about sharing your talent this week. Please share a tutorial on how to mend clothing. Or, perhaps, teach someone how to repair a torn couch or chair. Here's another idea ... offer to mend clothing for a friend or neighbor or alter items to extend their usable life (e.g., resize clothing for a child, add trim to a top to revive it, turn old drapes into a fun tent for kids, etc.). Examine all the textiles in your home. Take note of the materials and research if any chemicals were used in their manufacture. Investigate options for earth-friendly materials and share that information with others. And while you're at it, find out where the materials came from. For example, some textiles are earth-friendly but are sourced from other parts of the world making them, perhaps, not so earth friendly. Are you up for sharing this week? I know that you are! Do you want to eat healthy but just don't have the time to prepare great, nutritious meals? I'd like to introduce you to Tess Masters; Actor, Presenter, Voice Over Artist and owner of the very popular blog, The Blender Girl. Tess loves her blender and uses it extensively to create healthy "fast food". Via her Blog (The Blender Girl), The Blender Girl Smoothies app, and her book (The Blender Girl cookbook), she shares recipes for delicious creations such as Pumpkin Pie Smoothie and Cream Of Artichoke Soup. Women, however, do not live on Smoothies, Soups, and Blenders alone ... either do men! So, Tess uses other appliances to create yummy food. For example, the recipe for Gluten Free Vegan’s Pizza Buns uses a mixer. A food processor makes a quick and delicious Alkaline Raw Cauliflower Tabouli. All recipes are gluten-free and many are also dairy-, egg-, nut-, soy- and corn-free. Each one is quick to prepare and nutrient dense. Tess has very graciously agreed to share a wonderful recipe with us. This one comes from her book, The Blender Girl cookbook. In a saucepan over high heat, bring the 1/4 cup (60ml) of maple syrup and the water to a boil (this should take less than a minute). As soon as the mixture bubbles, reduce the heat to medium-low and stir in the apples. Cook the apples for about 15 minutes, stirring occasionally, until they caramelize lightly and soften slightly but remain mostly firm. While the apples are cooking, put the coconut milk, the remaining 3 tablespoons of maple syrup, the vanilla, ginger, spices, and salt into your blender and blast on medium-high for about 10 seconds, until combined. Add 1 1/2 cups (225g) of the rice and process on medium-low for a few seconds, until creamy but rustic. (If you’re using a high-speed blender, be careful of overdoing it; you don’t want a completely smooth blend here, and it can happen quickly. The pudding will be goopy if you overblend. If you’re using a conventional blender, your machine will let you know when the mixture is ready; it’ll thicken and be difficult to blend.) Add the blended mixture and the raisins to the cooked apples and stir to combine. Stir in 1/2 cup (120ml) of the almond milk and the remaining 11/2 cups (225g) of cooked rice. Reduce the heat to low and simmer for about 5 minutes, until the mixture thickens slightly. Stir in the remaining 1/2 cup (120ml) of almond milk and simmer for 5 minutes more, until you have your desired consistency (I take my rice pudding off the heat as soon as the liquid has been absorbed). Tweak the maple syrup to taste. Serve warm, at room temperature, or even chilled; add 2 tablespoons to 1/4 cup (60ml) milk if you serve it chilled, to soften it up. Sprinkle pistachios on each serving. For more recipes, buy Tess's Book HERE or get The Blender Girl Smoothies app HERE. And be sure to follow Tess on Twitter (@theblendergirl) for tips, recipes, and great content. I prefer to put natural ingredients on my skin ... I just feel better knowing that nothing toxic enters my body. In fairness, though, I've done a bit of research on antiperspirants and deodorants. We've all heard that aluminum is linked to Alzheimer's and Parabens can mimic the hormone estrogen, causing cancer. Let me say that in all the research that I've done, no scientific studies have found these claims to be true. In fact, they suggest that products containing either of these ingredients are "probably" safe to use. It's that "probably" that I have a hard time with. In fact, I have a hard time with anything that might cause health issues, especially when there are natural, safe alternatives on the market. I was invited to try Celadon Road's Coconut Deodorant. cocos nucifera oil, cetostearyl alcohol, ethoxylated sorbitan ester, sodium bicarbonate, organic zeamays starch, manihot esculenta root starch, organic camellia sinensis, organic juniperus communis, organic rosa mosqueta, organic mentha piperita, wild harvested fucus vesiculosus, organic petroseliumum crispum, organic symphytum officinale, organic arctium lappa, organic tellaria media, organic taraxacum officinale, organic echinacea purpurea, organic foeniculum vulgare, organic trigonella foenum graecum, organic zingiber officinale, organic capsicum annum, trifolium pratense, cocos nucifera milk. You'll notice that it does NOT contain aluminum, parabens, propalyne glycol, phthalates, or triclosan ... all ingredients that have been linked to health problems. The ingredients are certified organic and the product is NEVER tested on animals. Oh ... and did I mention that it's made in the USA? Yep ... it hasn't traveled around the earth to get to your home. Yay! Deodorants prevent odor-causing bacteria from thriving under our arms. Natural versions typically include things like baking soda which neutralizes the bacteria. They do not prevent sweating. Antiperspirants stop a person from sweating by plugging the pores under our arms. Since a wet environment is perfect for bacteria, antiperspirants eliminate odor by not giving the bacteria a place to thrive. Antiperspirants usually contain things like aluminum and zirconium. It's important to note that, as far as I can tell, chemicals are necessary to stop sweat ... that's why you don't see natural antiperspirants. I'm not bothered by sweating. I believe that it's the body's natural mechanism for controlling our temperature. Odor, on the other hand, has more to do with what we eat, hormones, etc. No one wants to stink. The first thing that I noticed about this product is how good it smells. It was seriously hard to stop sniffing my underarms once it was applied. Application is simple. The product pushes up from the bottom and is wide enough to easily cover the entire underarm area. One or two swipes is enough to offer full odor protection which I found to last 1-2 days. The deodorant feels good on my skin ... a cross between a lotion and a silky powder. The instructions advise that we wait a few seconds to allow the product to dry before dressing. Playing the devil's advocate, I dressed immediately. There was no staining. The product comes in a 2.5 oz (71g) tube and sells for $18 (US). While that might seem a bit expensive, so little of the deodorant is used at one time that it should last forever ... well, for a good long time, anyway! Would I recommend this deodorant? Absolutely! It's a safe product which performs well. 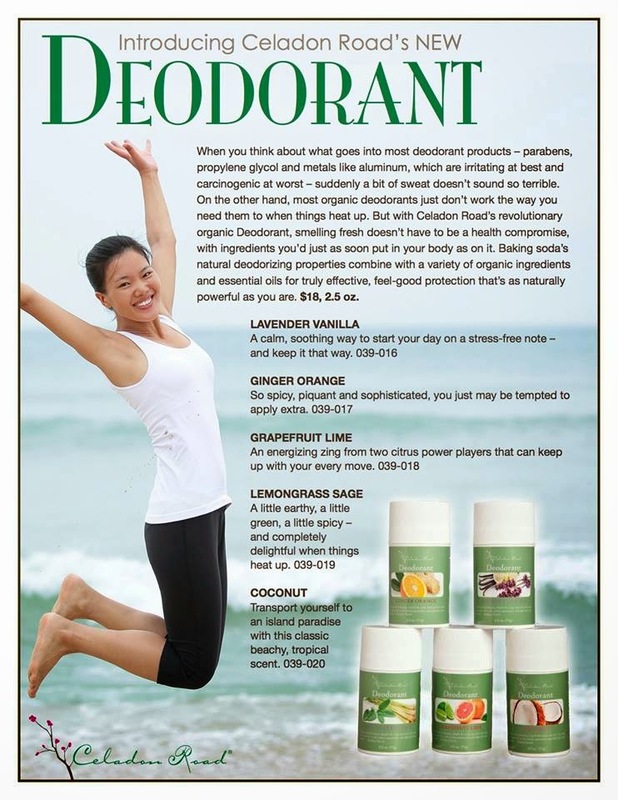 Celadon Road deodorants come in a variety of scents. If you'd like to try them out for yourself, you can purchase them HERE. My friend, Amanda, is offering a great start-up package for anyone looking for a business opportunity. If you're interested in becoming a part of her team and distributing wonderful, Eco-friendly products, check out her generous offer on the Special Offers Page. I received Celadon Road's Coconut Deodorant in order to write this review. I received no other compensation. All opinions expressed are mine and mine alone and reflect my honest opinion of the material reviewed. The Little Free Library movement lets you share with passer's by by simply placing a waterproof place for books to pass around. When I buy things at the store I try to buy those with containers that can be used and re-purposed in my home. I have also gotten some containers like old crates and painted on them to be sold in my craft business. Share backyard garden bounty with friends, neighbors, and people in need (depending on how much excess I have). The top way that we share is via second hand stores, both donating to and buying from. I remember a time when people looked down on thrift stores. For many, it was a symbol of poverty. The stores seemed to share that belief, as well, because they accepted any donations, even broken items, and didn't make shopping a pleasant experience. The general belief seemed to be that something, even a torn or broken item, should be gratefully taken by those who couldn't afford better. These days, things have changed. Thrift stores are picky about what they accept, saying no to unusable items. Products are neatly, and often attractively, arranged so that the shopping experience is a nice one. Second hand stores, today, are a mixture of boutique, consignment shop, and garage sale. They are fun! Attitudes have changed, as well. I'm sure that there are still folks who wouldn't step foot in a Goodwill, but most see it as a practical way to reuse items and avoid the need to manufacture new things. And yes, it's also a way to make our money go further. The survey showed that we use a lot of ways to share resources. We blog and use social media, we offer things on Freecycle, and we both lend to and borrow from friends. Many people mentioned using the library. In preparation for several posts this month, I learned that libraries offer more than just books. In some communities, libraries loan art, tools, and even seeds. I learned about a new way to share, Nextdoor.com, which I'll be looking into as a way to, perhaps, start a seed swap. It was no surprise to find out that many readers generously share garden vegetables with friends and family. Sharing resources is good on so many levels. It helps avoid the over-consumption of natural resources. It builds community and encourages compassion. It's a way to reduce waste, avoid toxins, and protect the earth. I'm enjoying our month of sharing resources. Are you? Last week we shared seeds and/or gardening tips. I don't have any seeds to swap, this year, but I'm hoping to have plenty next year. In the meantime, I've been researching plants which will thrive in my area and learning about the different kinds of seeds available to consumers. In Holistic Living & Growing Vegetables I talk a bit about the difference between hybrid and open-pollinated plants, how some seeds are sprayed with chemicals before they are packaged, and what I'll be choosing for my garden this year. I know that Alicia loves her garden. It turns out that she's also a generous gardener. Here are her comments: "I so agree thinning plants is a great way to share. I am always so glad to tell anyone that will listen all of the benefits of having a garden. I love sharing about the ways we have found to cut back and pretty much eliminate harmful pesticides. Also I am always up on hearing about the way other people garden and their success stories." 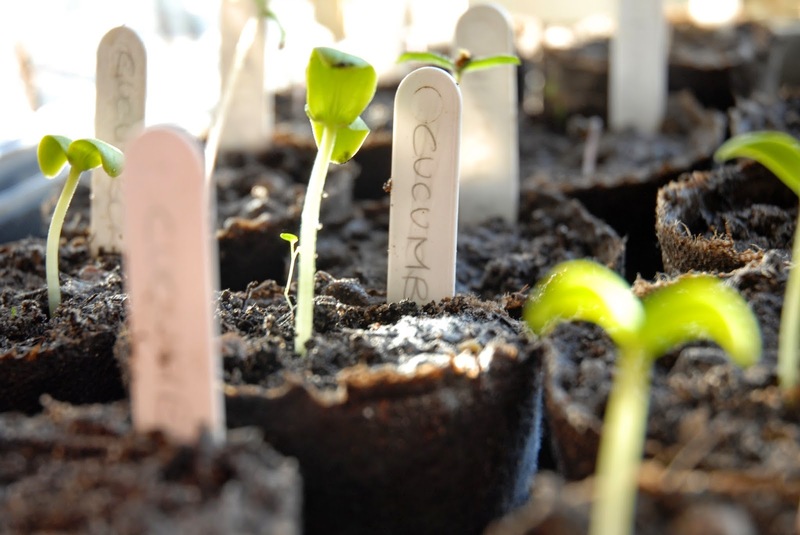 Did you know that most US cities have seed libraries ... as in, you can check out seeds? That's just one of the interesting facts that I learned in Share seeds and gardening knowledge. Vicality also includes some very useful links like one for the Seed Savers Exchange. Ann wrote a post about sharing transportation. You can see it HERE. That mode of transportation has far-reaching benefits! Charlotte stopped in and left this comment: "Thank you for adding me to the #CTWW gang. It is a honor to be a part of it. I will research this weeks challenge which is a really good one. Suits me like a glove :) "
Lois took the challenge to heart and, in Money Steals our Wealth and a Giveaway offers to share seeds with readers. Check out her post to see what she's giving away. Do your plants walk? They do in Randy's garden! In Our Vegetable Love: Helping Plants Walk Around #ctww he talks about sharing plants, a beautiful ground cover, and why he's not using his lawn mower much. Be sure to click the link to his little free library ... it's awesome! Would you be interested in getting seeds for free? Morag tells you how in Getting seeds for free. And if you grow plants from seeds and/or cuttings, you'll be interested in GROWING STEADY. Christine regularly shares with her community. This comment made me wish that I was her neighbor: "I spent part of yesterday morning sharing out Jerusalem artichoke tubers - was given three, ended up with many at the end of the season but we didn't like them so I offered them to others. Last autumn I split up my polyanthus and ended up with far too many so these were given to the local community allotment to sell for funds. I often put in a few extra seeds of things like different beans to share with others. This year I'm going to try letting some of my runner beans dry on the canes so that I can plant them next year." Maryam decided to continue with a previous challenge. She says, "Well, since I don't have a garden at the moment I didn't take part in this challenge. I still wanted to do something and decided to carry on last week's challenge. So I went through my home library and got rid of the books that were not being lent or read anymore. Thanks ebay and charity shops :-) and thanks Smallfootprints for the motivation :-) " Absolutely my pleasure, Maryam!! If you do a search about seed sharing, you're likely to find articles about activists, food legislation, the fight against GMOs, and even laws designed to restrict this traditional activity. It's sad, really, that a practice which promotes plant biodiversity, helps people grow their own food, and encourages bonds between neighbors, should be so controversial. Big business worries that if we save and share our seeds, we won't need them. I believe that the truth is just the opposite. I've seen thriving seed companies offer consumers open-pollinated seeds (the only kind considered viable for seed saving). Not only have they NOT lost business, they've actually increased business because even if we save seeds, we typically want to try out new varieties or, for one reason or another, feel we need to restock our supply. And new gardeners need to start someplace. So let's hold on to our power ... the power to grow our own food in a sustainable fashion. Promote seed saving and sharing for our future. When I moved into my first home, my Dad gave me a box of tools. He went through all the items that he had accumulated over the years, separated out duplicates, and gave them to me. It was the best gift! Those tools served me well for years. These days, tools come in a lot of colors and are made from a variety of materials. Unfortunately, they are expensive and use a lot of resources in the manufacturing process. And here's the thing ... for the majority of time, tools simply lay in a box or hang from a peg. That's a lot of money and resources for something which most of us don't use daily. This week consider setting up a community tool bank for your neighborhood. Choose a location and ask everyone to make their items available for use. There are great online resources for starting a sharing bank. You can also investigate other sharing methods in your area including local libraries which may loan tools out. Go through all your tools and give away any extras. They'd make a great welcome gift to a new neighbor or they can be donated to a local charity. I'm certain that offering them on Freecycle would bring smiles to a lucky recipient's face. Share information about tools. This can be a review or tutorial about online tools (how to track your home's energy use, a comparison of blog graders, etc. ), advice about gardening/yard equipment, or even a discussion on household items (vacuums, food processors, etc.). 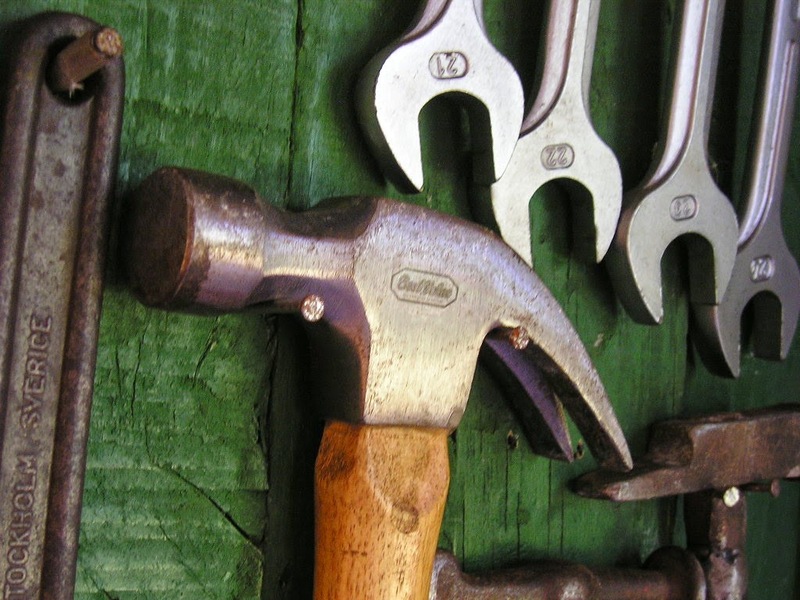 This week we're focusing on tools. Are you up for the challenge? I know that you are! Our late vegetable garden in 2014. Are you starting to think about a vegetable garden? I am! We moved to our property in July of last year and even though it was late in the season, we planted a few rows of veggies. Our harvest was surprisingly good considering our late start. This year, I'm prepared! In January I started studying up on companion planting, planting zones, moon dates, and even designed our space. In researching my options, I began to think about a holistic approach to growing food. Rather than think about this year and what we'd like to eat, my thoughts were about next winter and what can be preserved either through canning or storage in our root cellar. In fact, I thought about the next five years and considered things like seed saving and setting up a small green house to enable us to start seeds indoors to be transplanted, later, in the garden. Plants are available from nurseries, online retailers, and even the big box stores. In my experience, the choices are limited, most of the plants are hybrids, and the price of one plant is typically higher than the price of a packet of seeds. On the plus side, plants are easy to pop into the ground and typically ensure success. They are also good for people who don't have much space. Seeds are less expensive, are available for a greater variety of plants, and, in addition to hybrid plants, include organic, heirloom, and open-pollinated options. The draw back with seeds is that gardeners need a place to start them and they take time. Hybrids are the result of crossing two plants of the same species (not to be confused with GMOs which cross different species). Desired properties of one plant are introduced to another plant via controlled measures (grafting, cross pollination, etc.). Hybrid plants are usually disease resistant and may be able to handle environmental problems like drought, short growing seasons, etc. The down side is that if seeds are saved from a hybrid plant, the resulting plants won't stay true to the parent plant. That means that gardeners will have to continue buying seeds each year. Open-pollinated plants are either self-pollinated or are pollinated by wind or insects. Seeds from these plants, for the most part, can be collected and the resulting plants will be true to their parent plant. Heirloom plants fall into the open-pollinated category ... open-pollinated plants produce seeds which are saved and planted the next year. The downside of open pollination is that the wind or insects may cross pollinate a plant, resulting in a slightly different "baby". For example, if you plant both sweet and hot peppers close together, plants grown from saved seeds may have the properties of both plants. Organic seeds aren't treated with any pesticides and come from organic plants. They tend to be a bit more expensive than non-organic varieties. Non-organic seeds are usually sprayed with a pesticide and come from non-organic plants which were probably also treated with chemicals. When dealing with non-organic seeds, one should wash their hands thoroughly after touching them and, if you're thinking about feeding old seeds to the birds, don't ... the chemicals used to preserve the seeds will harm animals. So what have I chosen to do? I have a large space. So I'm choosing seeds which I'll start in a very simple "makeshift" green house (an insulated raised bed covered with old windows). I want to be able to save seeds so I'm choosing open-pollinated varieties. To avoid the introduction of chemicals into my garden, I'm going with organic. Start-up costs for our garden may be a bit high but, in the long run, we'll be able to grow nutritious foods for very little expensive ... foods which will be grown in harmony with nature. Here's a tip which I learned from an experienced farmer in my area. I asked how he irrigates his crops and he told me that he doesn't. He shared that if one begins to irrigate, they will always have to irrigate. On the other hand, if plants are grown naturally, watered with rain, they will not need constant irrigation. I tested this theory out, last year, and wow ... he was right. The majority of the plants that I grew thrived. The trick, here, is choosing plants appropriate for the area and climate. Holistic living is looking at more than just this moment's action. It's considering everything and looking beyond the here and now. That's how I'm approaching my garden this year! How about you ... do you take a holistic approach to growing food? Have you ever been stung by a wasp? I have and it's not fun. In fact, it hurts ... a lot ... for a long time! When wasps took up residence in a bird house that I had hanging on the patio, I started investigating ways to get them away from us. Every solution destroyed them. Here's the thing ... the methods used to destroy pests in our homes and/or gardens also, typically, destroy beneficial insects. I also tend to believe that all creatures have their purpose and if it's at all possible, I'd like to repel pests rather than kill them. So I was thrilled when I was invited to read Natural Homemade Pest Repellents by Kate Wiler. Kate shares my philosophy and looks for ways to discourage pests from "bugging" us rather than using toxic chemicals to kill them. Natural Homemade Pest Repellents starts out with some basic advice. Since all creatures want food, water, and shelter, it's important to make sure that your dwelling isn't attractive to pests. So, Kate suggests some general home and garden maintenance to get started. The next section talks about natural repellents. You might be surprised to learn that many of the things you have in your kitchen like herbs, garlic, and even vanilla extract can be used to ward off nasty insects. In the garden, there are a variety of flowers which will discourage pests from destroying your fruits and veggies. Kate offers recipes and instructions. The remaining chapters talk specifically about common pests. Chapters are devoted to such critters as ants, fleas, mice, and yep ... wasps. There's a lot of information in these chapters. For example, did you know that spiders hate the taste of citrus oil? Or that Aloe Vera repels termites? I usually don't like reference ebooks. In truth, it seems much easier to reach for a book on my shelf rather than scroll through the pages of an ebook. I expected to find Natural Homemade Pest Repellents difficult and cumbersome. I was wrong!! This is a handy reference guide. Using the table of contents, readers will find it easy to navigate to areas of concern and find real solutions to pest problems. Natural Homemade Pest Repellents sets a high bar for ereader reference books. One concept, which I particularly love about this book, is the idea that some of what we consider pests are actually beneficial insects and animals. When we kill them, we jeopardize the diversity of life on earth. While the book does offer ways to kill certain pests, it always considers ways to repel them as a first line of defense. Absolutely!! 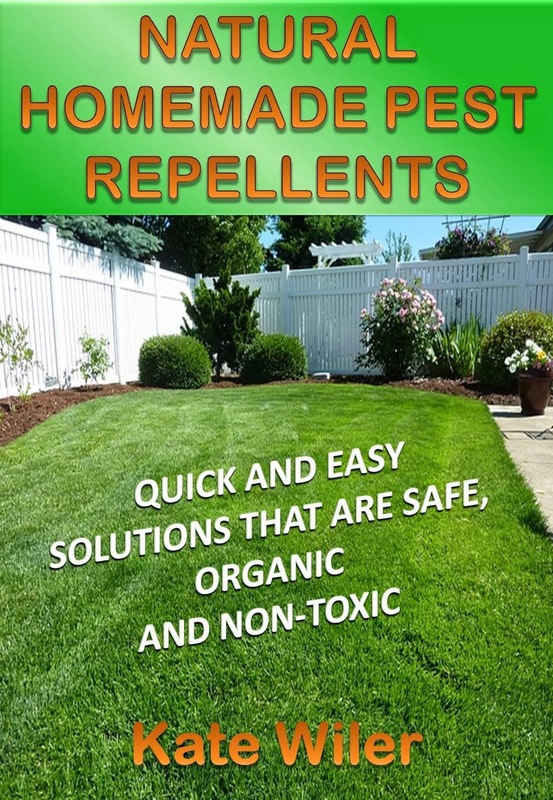 It is well written and organized, easy to use as a reference guide, and offers non-toxic, earth-friendly ways to deter unwanted guests to both our home and garden. Remember those wasps that I mentioned at the beginning of this post? Well, I learned something interesting about them. 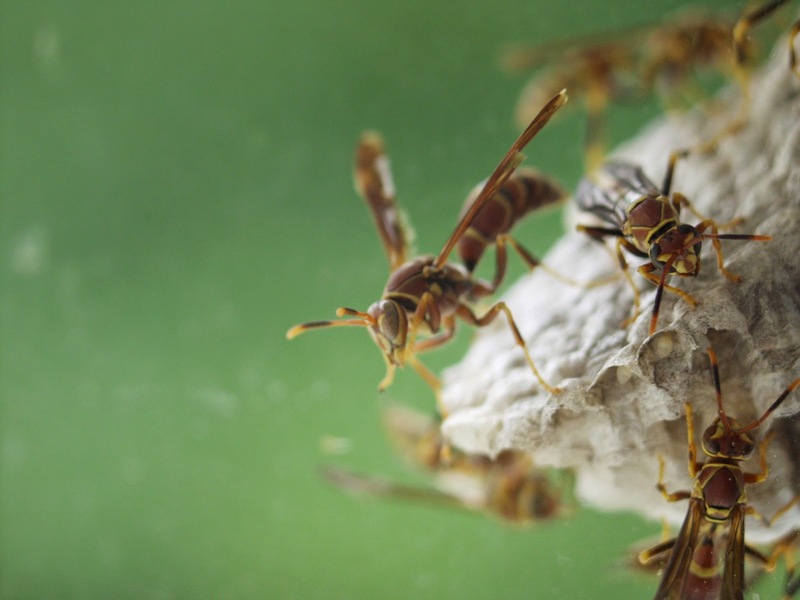 For almost every insect species, there is at least one wasp species that preys upon it which makes wasps an important way to control insect populations. Killing them isn't a good idea ... repelling them is! If you'd like to pick up your own Kindle version of Natural Homemade Pest Repellents or any of Kate Wiler's Eco-friendly books, please click HERE. And if you don't have a Kindle, no problem ... download the FREE Kindle app which allows users to read books on their smartphones, tablets, and computers. I received a copy of "Natural Homemade Pest Repellents" in order to write this review. I received no other compensation. All opinions expressed are mine and mine alone and reflect my honest opinion of the material reviewed. Last week began a month of sharing resources. Our first challenge asked that we share books. I love to read but don't actually own many books. The ones that I do own tend to be reference materials which I refer to often. While I love the look and feel of books, it seems a waste of money and resources to own one which I might only read once. So I use the library. Christine joined us and shared this: "I thought books came from libraries and went back before the fine was due. I only keep a few reference books (gardening)." LaAlicia shared her favorite way to save paper. Check out Quad Chevron Necklace Made With Security Envelopes. What a beautiful way to share resources! Clare accepted the challenge. Here are her comments: " Living on a small tropical island has its challenges – there isn’t the range of choices in food, décor, clothes etc. But it’s extremely good in other ways – we all share. A lot. I go to fortnightly Scrabble games where we all bring books, DVDs, newspapers and magazines that we’ve read, and share them around. A monthly charity meeting has a library for books and DVDs where we buy items and the money goes to a good cause. When someone falls ill, we all rally round and bring our books, puzzle books and magazines to keep them entertained, and car-share hospital visits. When we entertain, we rely on others. Mostly, we’ll have enough cups, plates, glasses etc for ourselves but not for a get-together. So everyone brings along their glasses or whatever’s needed and it’s good fun. No point in buying multiples of everything just for entertaining and then have it sitting there taking up space the rest of the time! There aren’t facilities for hiring tools (sadly), but again we rely on borrowing from friends rather than buying our own. Recycling glass is now possible here (hooray), so we bring ours to one spot and then only one car makes the long journey to the recycling place. If we visit friends and we know they’re going to the paper or plastic recycling bins (which are a little closer to home), we’ll bring our recycling with us to our friends, and they’ll make one trip. None of this is new or innovative – it’s what used to happen – and it just makes sense. Thanks for another good CTWW challenge - I hadn't really thought about the amount of sharing we do!" Morag stopped by and said, "Great challenge. If anyone manages to complete the lend part of this challenge it they can check-in here: http://www.worldchanging.me/education-and-culture/book-worm-well-read/level-2 it's "level 2! of a three level quest. If you borrow something from your library check-in on this quest http://www.worldchanging.me/community/library-love/level-2 - again level 2 of a three level quest - GOOD LUCK :) "
Alicia completed this task: "We don't buy a lot of books or magazines. We usually do most of our reading on line because it makes for so much less waste. However recently I started going through some boxes that we had in storage while we lived in California and found several books that I had forgotten we had. I got them together and donated them. Some went to a homeschooling family and others we donated to other organizations." Maryam joined us. She says, "Hi there! Wow, thanks for the mention, it was unexpected! How exciting hihihi I really like this months challenge and this week's challenge is so cool too! A couple years ago I started buying second-hand and new books to build a mini library. Now I lend books out for free, for an unlimited time (except if someone else wants to read the same book) and fines do not exist here! I love the idea of sharing resources and books especially as I absolutely love books!! On my blog you can find a page dedicated to books that I have recommended on topics such as natural living, natural child rearing and spirituality: http://natural0woman.blogspot.co.uk/p/books-and-other-references.html Thanks for this challenge! Can't wait to read more!" Lois shared this: "This challenge would be a half fail for me. Yes, I share books and no longer keep most. Between my son, and two daughters-in-law I am able to share most of what I read, the rest gets donated to a charity run thrift shop or the local library. But where I fail this month is in purchasing books. I have been trying very hard to only read ebooks this year, but I long to hold a paper book in my hands so I ordered a couple of books I haven't been able to find in digital format from half.com. To save on packaging (and shipping costs) was to locate one book I wanted then scan through everything that seller had to find a couple more on my wishlist. When I am done with them they will be passed on." Thanks to Deborah for her comments: "I love the CTWW Challenges! In my building we started a used book lending library in our laundry room to share books. My neighbor collects old books and sells them for a dollar in front of our building and donates funds to her favorite charities. I love to use my local public library rather than buying new books.I also gather used books and share them with book-loving friends and relatives. Thank you so much for sharing this CTWW Book Challenge with us at the Healthy, Happy, Green and Natural Party Blog Hop. I'm pinning and sharing!" Vicality not only challenged their readers to visit a library, they talked about why sharing books is a good thing. They even provided addresses to local libraries for readers' convenience. Check out Visit your local library. - love the small library idea! Will think about the possibility to create something like that in our community. - I have a box of books in the attic that is waiting for the next flea market. Public libraries have been around for a long time (for a great article on the history of libraries, read this post: http://www.straightdope.com/columns/read/2236/how-did-public-libraries-get-started). While their original purpose had little to do with protecting the environment, it did recognize the need to share resources and ensure that all citizens had access to information. Libraries before this time (The Boston Public Library, considered the first US public library, opened in 1854) were basically collections of books (sometimes offered to friends or members of a club) which weren't maintained. So they deteriorated relatively fast. The opening of the The Boston Library started the preservation of books. This had a wonderful side benefit ... it created an Eco-friendly way to share resources. Thanks, everyone! If you wrote an article, I Tweeted, Facebooked and posted it on Google +. You can help spread the "green" word by using the share features located below this post. Years ago, new brides were given seeds to plant at their new homes. The seeds were collected, typically from a family member's garden, and shared as a way to help the new couple feed themselves. The practice ensured plant biodiversity. Today, most people head to the store for either a packet of seeds to plant or seedlings which have been started in commercial nurseries. There are very few varieties available and most are not organic. Not only has biodiversity suffered, it is nearly impossible to save seeds at the end of the harvest for next year's garden. This week, consider hosting a seed swap. Invite some friends and ask everyone to bring organic seeds to trade. If you'd rather not host a swap, investigate swap parties in your area and participate (it's a great way to get to know neighbors and other gardeners). Or, start a seed library by organizing seed donations and making them available to neighbors. The idea of this challenge is to share seeds in a fun, creative way. If seed swaps and/or libraries aren't your thing, share gardening information on your blog, social network, or while visiting with a neighbor "across the fence". Consider sharing books which you've found useful or helpful Internet sites. Perhaps share tried and true techniques. And be sure to listen ... others have a wealth of information which might help your garden to prosper. The idea of this challenge is to share information so that we can all have fabulous gardens this year. We're sharing seeds and gardening information! Are you up for the challenge? I know that you are! 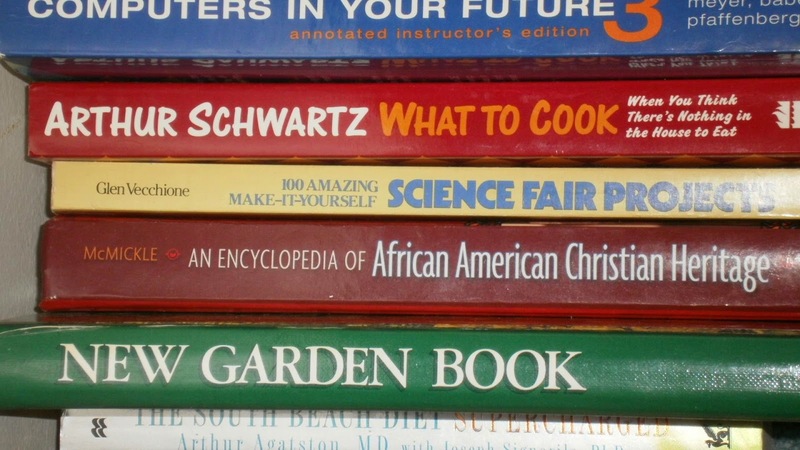 Do-It-Yourself (DIY) recipes are available, online, for just about everything. And that's great for people who are into making stuff. Making stuff isn't for everyone. So we look to commercial products to fill our needs. In my experience, shopping for Eco-friendly products at the market is difficult. 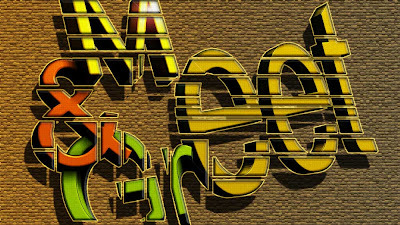 The selections are limited, the expense is high, and one has to be very careful about ingredients because not all so-called green items are actually green. 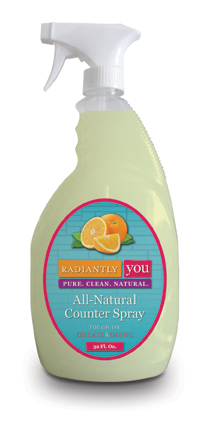 I was invited to try out the Ultimate Cleaning Package by Radiantly You. Before agreeing to do a review, I asked about where the items are manufactured and was told that everything is made in the US (WNY). Their packaging is also made locally. The soap/shampoo packages are made out of recycled content (they are nifty cardboard containers with "please reuse & recycle" stamped into the back). Other products are packaged in plastic which is not made from recycled content but which is, itself, recyclable. None of their products are tested on animals and most of them are vegan (some of the body care products, like the lip balm, contain bees wax). As you can see, they are reasonably priced. 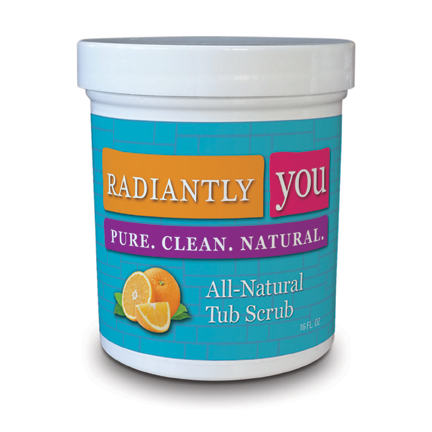 This tub scrub resembles common cleansers like Ajax, Comet, etc. Unlike those brands, it includes ingredients such as castile soap, sodium carbonate and certified organic essential oils. One simply scoops out the necessary amount, scrubs it onto the tub surface, and then rinses it away after 5-10 minutes. I used a damp cloth to apply the cleanser and it worked great. The counter spray includes some of the same ingredients as the tub scrub. The concentrated solution is poured into a spray bottle (which was included in the package) along with water and the spray is ready to go. It's easy to use ... spray it on and wipe it off. It worked well on oil splatters in the kitchen and shinned up the sink area in the bathroom. It smells great, too! 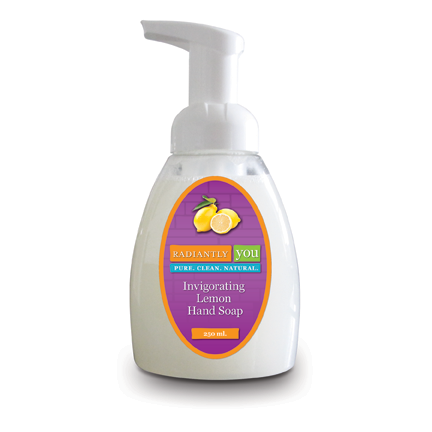 This hand soap smells luscious! It's like washing with lemon meringue pie. It contains several oils .. organic pressed coconut oil, castor oil, and sustainably harvested organic palm oil. One or two pumps is enough to thoroughly clean one's hands. It leaves my skin feeling clean and soft. The all-in-one soap is great! One can use it from head to toe. As a shampoo, it creates a nice lather and left my hair feeling clean and soft. As a body soap, it cleaned my skin without drying it out. The dead sea mud soap has a slight mineral smell. 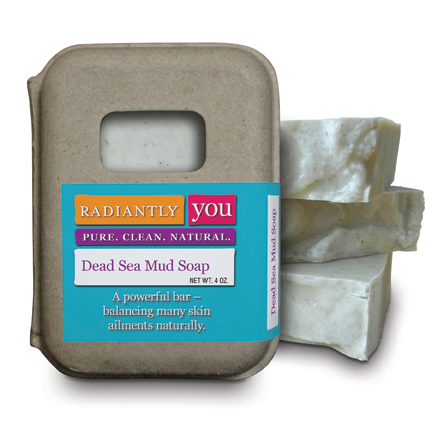 Dead sea mud is know to improve the skin's natural processes. It penetrates the deep layers of the skin and helps improve blood circulation. 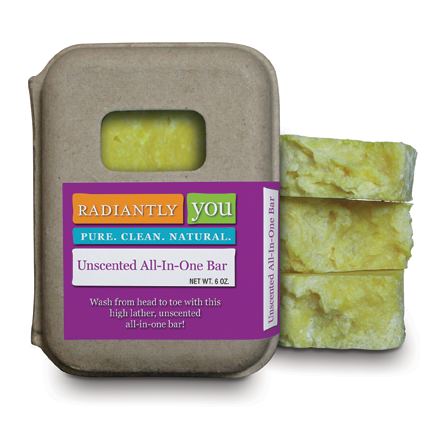 This bar works well as a soap and I love that it has beneficial, healthy qualities. This toothpaste contains coconut oil which has beneficial properties. Used in the mouth, it has the ability to draw out the bacteria which gets stuck between teeth and under the gums. If you've ever used this oil, you know that it is solid at cooler temperatures. The directions on the package instruct users to scoop out a small amount and place it on the toothbrush. I found this a bit difficult because of the solid nature of the oil ... it flaked and wouldn't remain on my toothbrush. So I simply popped some into my mouth, allowing my body's temperature to melt it and then brushed as normal. I will admit that, being used to the more common cream-type paste, this product is a bit difficult for me to get used to. That said, it has a nice flavor and cleans teeth using natural, healthy ingredients. These products contain ingredients which are safe, non-toxic, and familiar. In fact, they are items which are commonly included in DIY cleaning solution recipes. So I felt confident in using them without worry. All of the products, which I tried, worked. The cleansers left counters and the tub smelling nice with a gentle citrus smell. In my opinion, these products would work well for anyone who likes the idea of DIY recipes but doesn't have the time or inclination to mess with them. To order these items or browse the rest of the Radiantly You product line, click HERE. 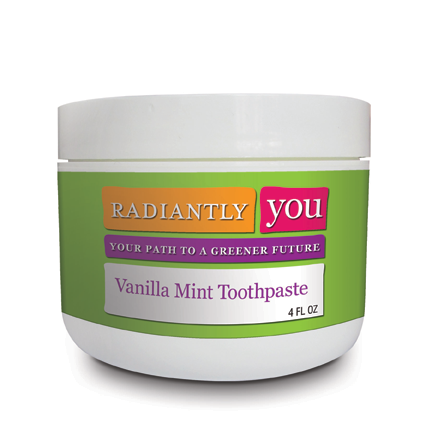 I received Radiantly You products in order to write this review. I received no other compensation. All opinions expressed are mine and mine alone and reflect my honest opinion of the items reviewed. For 2015, Meet & Greet will operate a bit differently than previous years. This year, I'll be featuring blogs which I find via my Internet travels or blogs which you recommend via the link-up widget below. Please visit the Meet & Greet Page for all the details. One of the first things that I noticed about this blog is the tag line: a relaxed place for all senses. That sets the tone for this interesting blog. Each post is well written and does seem to convey a calmness ... a sense of quiet appreciation for everything. So what kind of articles will you find? If you like Do-It-Yourself (DIY) projects, you'll find a bunch of them here. My personal favorite is one on DIY Natural Body Care. Charlotte shares recipes for things like deodorant and discusses the effectiveness of homemade products. Gardeners will love her post on frogs. It talks about creating a healthy garden habitat for these fabulous creatures as well as other visitors to your yard. Some of my favorite posts fall under the category "Well-being". They are profound and personal, as though a friend were sharing her heart with us. They encourage readers to take an honest look at themselves and their lives and decide on what's important. By sharing her own introspection, Charlotte gives readers the tools necessary to make positive changes. All of the posts support an earth-friendly life. One note ... some posts are in Swedish. They are easily translated and I encourage you to do so. I use Google Translate (https://translate.google.com/). 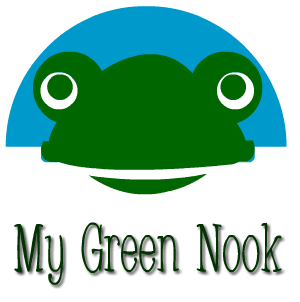 My Green Nook is well-worth your time. It is engaging, personable, and relaxed. I hope you'll hop over and visit Charlotte! Now it's your turn! Please use the following widget to list your blog and/or recommend a blog. For previous features, please click HERE. Sharing a bath saves water. This month's Change The World Wednesday theme is "Sharing Resources". To live green, we might share information, products, natural resources, etc. So that got me thinking about all the ways we can use "sharing" to walk gentler on the earth. Join us on February 19th for the results. I believe that we protect what we love. So last week, we took time to truly look at our world, hopefully developing a strong affection for nature and our planet. Walking in the snow, I noticed how tiny white flowers, which were blooming a week earlier when we had warm temperatures, were protecting themselves against the cold. They seemed to bow down and cover themselves with their leaves. My first thought was how to protect them. I gathered some leaves and mounded them around the plants, hopefully offering them some protection against freezing temperatures. Had I not gone for that walk, I wouldn't have seen them. So completing this challenge did, indeed, help me protect a precious part of nature. Aimee joined us and shared this: "Bummed I didn't see this challenge last week but looked great! I'm going to Forest Park for a hike with a friend on Monday (http://en.wikipedia.org/wiki/Forest_Park_%28Portland,_Oregon%29) - we are so lucky to have such a massive park - 8 miles of it!!) right inside the city accessible to everyone ....still with old growth trees and so quiet you forget you're in the city, it's wonderful." Lois accepted the task and said this: "It is bitterly cold today with temps in the single digits. But while it is cold I have the curtains open because the sun is shining brightly which makes me smile. There is an evergreen tree outside my bedroom window that is barely holding its limbs up under the heavy weight of the last snow fall. Yet, while I have no intention of spending any time outside today that tree with the contrast of the green with the white is lovely to gaze at while i type this." This edition of The Green Daily gave CTWW a nice mention! Thanks so much! Catarina and her dog took a moment to look out through the windows. They saw birds on a wonderful feeder. They occasionally see other animals, as well ... including foxes. Read her post entitled Wildlife for some great photos. Maryam decided to browse our list of challenges and take on one of them. She decided to replace a single-use item with a reusable. Not only that, she made the reusable item and posted a tutorial. Check out Hankies - Baby wipes - Face cloth etc. Excellent idea! Deborah left this kind comment: "Hi, You never cease to amaze me with your powerful, thought-provoking, eye-opening CTWW Challenges. I love the idea of going outside and looking for something special ... something to appreciate and love. It is important to look with intention. So often we look, but don't really see. Thank you so much for this week's CTWW Challenge with us at the Healthy, Happy, Green and Natural Party Blog Hop. I'm pinning and sharing!" Andrea headed outside on a warm day to appreciate the world. In her photo essay, Change the World Wednesday, she shares her discoveries. Check out that last photo ... what a beautiful visitor! Vicality asked their readers to take on this challenge and focus their efforts in Monterey Bay, California. Their post is entitled What matters most? Help protect it. Alicia left a fabulous comment: "We live on five acres with a small portion of it being wooded. We love walking through it because you are blessed to see squirrels, all kinds of birds, trees and so much more! Looking out the window today I can see so many birds nests up in the trees that are not visible when the leaves are there. It is so cute watching the squirrels today running around the yard getting some of their acorns that they have "stashed" all over the place! I think it is so important to save and protect the wildlife and trees. A good way to do this is not to use pesticides and harmful chemicals on your gardens and crops. Also there are a few of our herbs that are still growing even through these Winter months. In fact I am going to go out and pick some of the lemon thyme to use in a recipe tonight." Years ago I was told that, according to experts, if we went diving and saw fish, we were guaranteed to see fewer fish the next time we went out. While not a diver, I have enjoyed snorkeling and have seen beautiful varieties of sea life. Unfortunately, the expert's prediction was true. Returning to a spot, which I had enjoyed a year earlier, I noticed a dramatic difference. In some areas the fish had disappeared and sea plants were dying. If everyone went diving or snorkeling, would our oceans be in better health? I believe so. We protect what we love ... but love isn't automatic. We must nurture it and fan the flames. We've teamed up with Vicality who will post challenges with a "twist" so, if you're looking for a new spin on our activities, hop over and visit their CTWW page! As "greenies", we strive to reduce our consumption of natural resources. A fun way to achieve that goal is to share ... one item can serve the needs of many. Books require a lot of resources ... natural fibers, water, glue, etc. Let's start there! This week, share a book (and knowledge). Borrow one from your local library, lend a book to a friend, or create a mini library for your neighborhood (check out this site for inspiration: http://littlefreelibrary.org/). If you have books which you are no longer using, give them away to someone who might need them or donate them to a school. The idea is to reduce the need to print more books by sharing this resource. Think green products are too expensive?